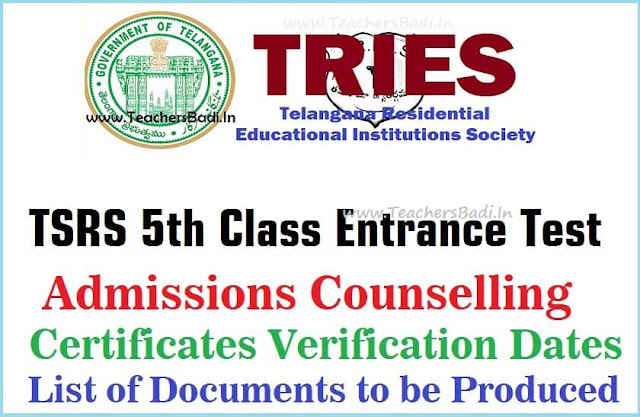 TSRS 5th,6th,7th classes Admissions Counselling, Certificates verification dates 2017/ TSRS 5th Class admissions counselling dates/treis 5th, 6th, 7th classes admissions certificates verification dates/list documents/call leters: Telangana State Educational Institutions Society(TSRIES) issued TSRS 5th, 6th, 7th classes Entrance exam 2017 Notification in March 2017 for admissions into fifth/sixth/seventh classes in Telangana Residential Schools in the Telangana State for the academic year 2017-18. The TREIS officials invited online applications from the Class IV/V/VI bonafide students as per its schedule for admission into V/VI/VII class in its TSR Schools and this admission test was conducted at all district head quarters. These results were released in this week and results are now available its web portal The students who were appeared for TS Residential Schools Admission Test 2017, they were checked their results @ http://tsrjdc.cgg.gov.in/. Now, Officials have announced the TSRS Admissions Counselling dates for admission into 5th class in TSR Schools. The Telangana Residential Educational Institutions Society (TREIS) announced the results of 5th/6th/7th class admission test held at all the Divisional Head Quarters. Counselling for the candidates for admission into 5th/6th/7th class for the academic year 2017-18 will be held at the Convener schools. Counselling: Candidates can visit ‘http://tsrjdc.gov.in’ or ‘http://tresidential.cgg.gov.in’ to know their results and attend the counselling, if they are shortlisted for admission. i) He/she should be born between 01.09.2006 and 31.08.2008. For SC/ST candidates there is a relaxation of 2 years is must have born 01.09.2004 and 31.08.2008.
iii) Must have studied in Govt/Govt Recognised school consecutively for 2 academic years i.e. 2016-17 and 2015-16.
v) Must belong to Rural Area( School Study area) for admission into General Schools. Rural study condition is not applicable to SC/ST candidates and all candidates of Hyderabad and Rangareddy Districts. Verification of Certificates: The Verification Boards have to verify the original certificates of each candidate as per the eligibility criteria with a check list. All the eligible candidates are to be sent to the Convenor for his approval before sending the candidate to Counselling Board for choosing the School for admission. Subject: TREI Society, Hyderabad – Conduct of 3rd phase Counseling for admission of students into class-V & for filling up of backlog vacancies in classes VI and VII for the academic year 2017-18 – Instructions - Issued - Regarding. The following guidelines are issued for 3rd phase counseling for filling up of the vacant seats in Class-V & for filling up of backlog vacancies in classes VI and VII for the academic year 2017-18.
b) Venue of Counseling : to complete the process by 19.08.2017. As detailed below. c) Merit lists of all the Candidates are sent to the Principals of TSR Schools by email. d) All the District Conveners named at column no.5 above are instructed to get latest vacancy position from all the schools under their jurisdiction and undertake sliding of students from one school to the other as per their option subject to availability of vacancies as per their merit and ranking. e) They are instructed to carry on the counselling and allotment of schools telephonically. In respect of the top ranking students, they may also be considered under their reservation category for allotment of a School of their choice in addition to Open Category. f) The district convener may constitute a counselling committee under his/ her chairpersonship with the ATP, a senior teacher and a senior member of ministerial staff available with the convener school. g) Cent per cent transparency shall be maintained in calling for the candidates as per their merit and ranking. In no case a better ranking candidate is to be ignored over a lower ranking candidate. h) District Conveners may utilise the services of any of his staff members for smooth conduct of the admission counselling and he will be held responsible if anything goes wrong in allotment of seats and schools. i) All the Principals in whose schools vacancies are available should attend the venue school along with the vacancy position and bidder list. All the concerned Principals have to conduct admission counseling cohesively. Receipt of these proceedings should be acknowledged.